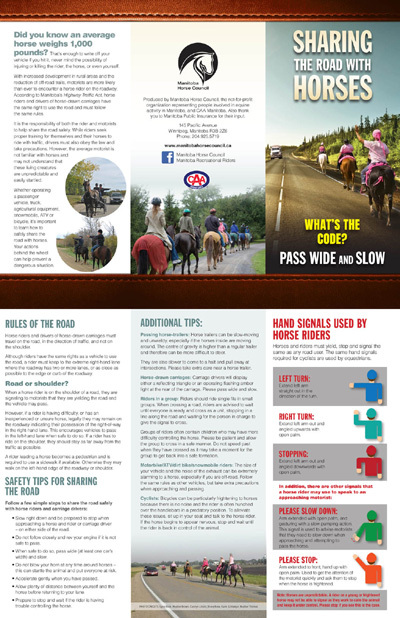 According to Manitoba’s Highway Traffic Act, horse riders and drivers of horse-drawn carriages have the same right to use the road as other users and must follow the same rules, but many motorists, bikers, cyclists and other road users are unaware of their own responsibilities in road sharing. With increased development in rural areas and the reduction in off-road trails, road users are more likely than ever to encounter a horse/rider or horse/cart on the roadway. 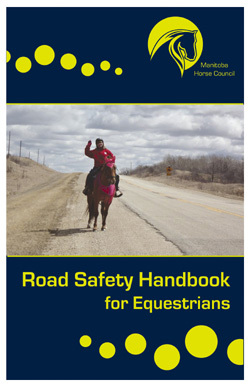 The Road Safety Handbook for Equestrians is free from the MHC Office, or download PDF here.